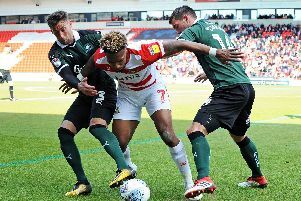 Darren Ferguson reiterated this week that Doncaster Rovers needed a ‘huge restructuring’ as a football club. Rovers, sat 14th in the table, are now all but safe from relegation despite back-to-back defeats against Oxford United and Blackburn Rovers. They are six points clear of fourth bottom Oldham Athletic, whose penultimate game is at home to Rovers this weekend, and have a much superior goal difference than the Latics. Despite consolidating their place back in League One, Ferguson has again been forced to answer questions about expectations after rumblings of discontent from the Keepmoat Stadium crowd. Ferguson said he was disappointed with the ‘frustration’ inside the ground during last week’s 3-3 draw with Bury. He then denied shouting back at a vocal supporter during Saturday’s disappointing 1-0 defeat to Oxford United. Speaking to BBC Radio Sheffield, Rovers’ boss accepted that expectations may have been heightened by the club’s recent spell in the Championship. “In the main the fans have been great. “They’ve seen a lot of good football, they’ve seen the success of a promotion last season. “They’re going to be frustrated, as we all are, when perhaps you don’t get the results you want every week. “We’re trying to find that consistency the best we can. “I think I’ve been very transparent with the message I give to the fans. “This club needed a big, big restructuring. A huge one in my opinion, and we’re only a small way through it. “Of course, everyone wants success. But there’s not many managers that have gone back to back [promotions]. It’s a very hard thing to do. “So I think we’re progressing okay. Could we have more points, did I want more points? Absolutely. “Some people get frustrated, some people understand it. “I don’t know whether it’s because we were a Championship club and it was a bit of an up and down sort of thing. “I think the team Sean [O’Driscoll] had was a very good team, a very good Championship team. “Since then it’s been a bit of a yo-yo and then obviously when I first came in we had the huge disappointment of going back down to League Two. “I did say at the time as long as we recover quickly it might not be the worst thing that’s happened, and I certainly feel that might be the case.